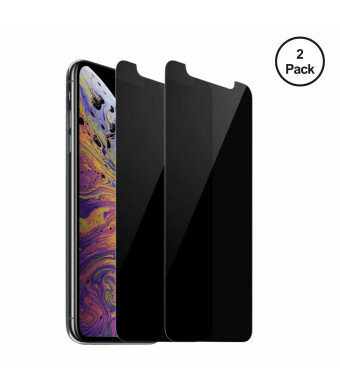 Screen is only visible to persons directly in front of screen, high quality iphone XS and iphone X privacy film in portrait or landscape viewing modes. High-definition Clear,Perfect cutouts on the front not to interfere with sensors or responsiveness, Protects against eye strain. With the special anti-spy film, please imagine that you use our privacy screen protector on your device and when you are out on the metro or bus, sure you can protect your sensitive data on your phone from the prying eyes. Only visible within +/- 30 degrees, keep your sensitive information safe from strangers.Keep your information safe. with 9H hardness, the screen protector can effectively ease the impact force and protect screen from scratches. Double protection for your phone by removing fingerprints, oil residues and smudges from the surface of your screen very easily with the spray and cloth, making your screen simple to keep clean. 1.Privacy cover will darken the image, so please turn your device display brightness up for a better view. 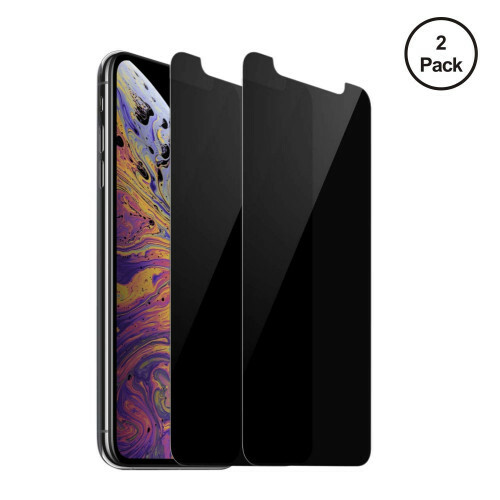 2.Privacy tempered glass screen protector does not cover the entire screen so that to enhance compatibility with most cases.Since iPhone X screen is round-edge design, tempered glass screen protector is of marvelous durability as well as a reliable option to protect your iPhone x and iphone xs screen from unwanted scratches, abrasions, scrapes, bumps or drops. 3.If bubbles do not disappear itself after 24 hours or any confuse about the installation, please feel free to write to us as soon as possible. How to stick iPhone Screen Protector? 1.Clean the iPhone screen with lint-free cloth. 2.Clean the screen with alcohol wet wipe then dry wipe. 3.Remove the dust of the screen with dust absorber. 4.Take off the adhesive backing cover on screen protector. 5.Line up screen protector and attach to iphone screen. 6.Use the lint-free cloth to squeeze out excess air bubbles.